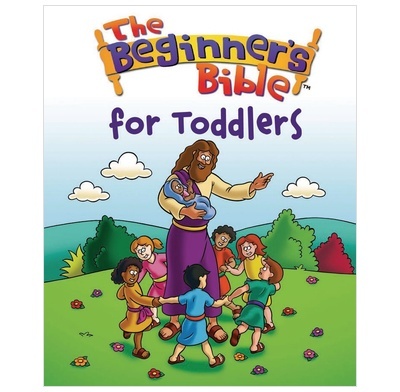 Child friendly colourful pictures accompany this great beginners bible for younger children, introducing main stories and characters from the bible. Bible given to a child when leaving Mum and Toddler group. Well received by parent/grandparent. Very heavy for a child. In our cluster of 6 Churches we endeavour to attract the young families bringing infants and toddlers for baptism and decided to present a copy to each candidate. As we purchased 50 copies this is a simple way of showing that we care. A bright and colourful introduction to bible stories. Is is a gorgeous book to give to a child. Bright colours, lovely illustrations, altogether a great way to start little ones into God's word. Particularly good to give to children in families that don't "do church". Highly recommend. We were looking for a first bible for our grandson aged 2. It looks as if it's going to be perfect for us to read to him with bright pictures and simple words that he will understand whilst not compromising on what the bible says. Out of all the children's Bibles I've seen, this is the one that strikes the best balance between being easy for young children to understand while at the same time thoroughly Biblical. The level of language used is probably aimed at age 4+, but since there's just the right amount of picture pages for each story, it also keeps the attention of younger children. My three-year-old has loved his since he was not quite two, and with the occasional re-wording of some of the harder concepts, or sometimes just talking about the pictures, he has gained a real understanding of most of the stories. We use it with the Beginning With God notes, which are also excellent, and he really looks forward for his Bible story every evening, and at other times of day he will sit and look through it or ask for a story to be read to him. Highly recommended to all Christian parents or anyone wanting to buy a Bible for a young child. A young child friendly bible, i.e. around age2, but it is missing key stories, such as Adam & Eve rebellion, which without the bible does not make sense. Disappointed with this 'toddler' version, perhaps the fuller version is better?